I have a Sinclair tool and use it. I would like to suggest that they add a spring that can be fastened onto the indicator stem below the indicator clamp to put pressure on the case neck/ pilot interface. That would overcome the clearance between the ID of the neck and the OD of the pilot at the point of measurement. The clearance is necessary but can lead to jumping as the case is rotated. Thank you for your time. A friend has one of the Sinclair tools, without a base. You can hold it in one hand with your index finger on the top of the exposed spindle that sticks out of the top of the indicator. 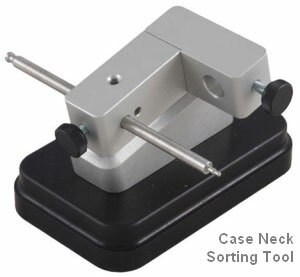 By applying pressure you can pin the case neck to the mandrel. The best way to do this is to press and release four times, turning the case 90 degrees each time. This gives more reliable readings than depending on indicator’s internal spring and trying to take a continuous measurement to determine runout. Some shooters do not know that simply correcting neck runout by turning does not fix the whole case. 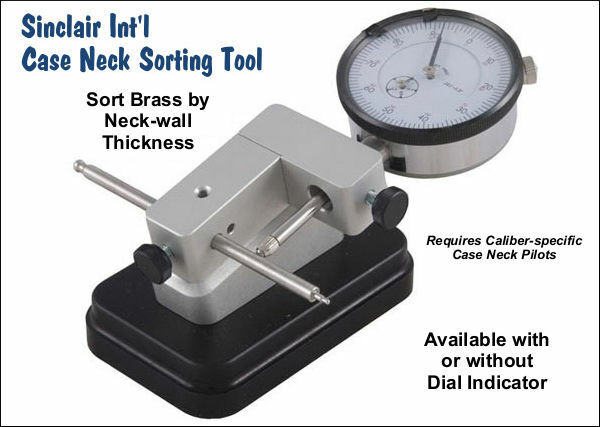 Eccentricity found in the neck thickness will run down the case and may increase closer to the bottom. Evidence of this may be seen by examining the bulge near case heads that is commonly seen on fired brass from generously dimensioned factory chambers. If the bulge is more pronounced on one side, that side is thinner. and inside of the neck must be clear, flat, no donuts!